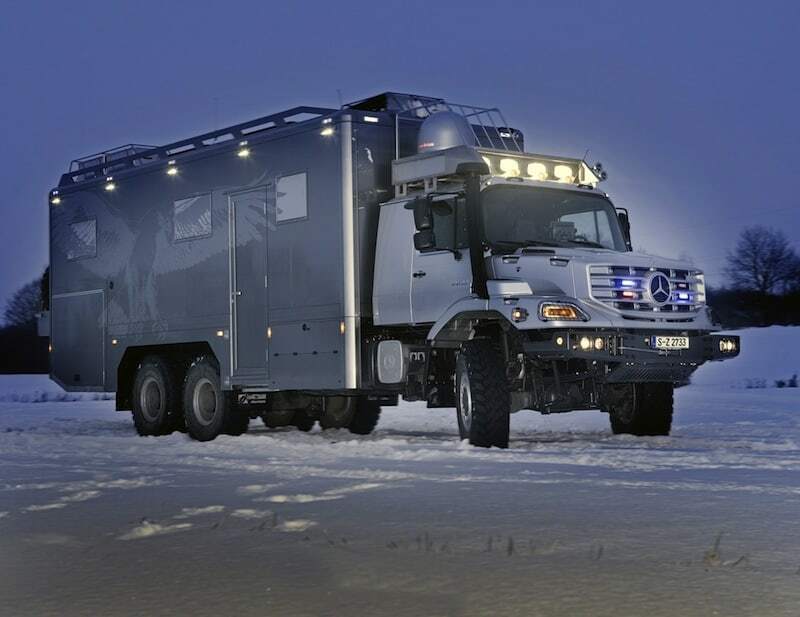 Stuttgart/Ulan-Bator – The all-wheel drive Mercedes-Benz Zetros is in its element wherever all-terrain capabilities and a high payload are required. This cab-behind-engine model for difficult off-road conditions is not only suitable as a commercial vehicle, but also as a basis for recreational and expedition vehicles. This is demonstrated by two Mercedes-Benz Zetros 6×6 with special bodies and interior fittings which have recently been delivered to Ulan-Bator, the capital of Mongolia. Mongolians love their freedom, and greatly enjoy excursions into the varied natural surroundings of their high-altitude homeland. Whereas only the horse was once a suitable means of transport for this purpose, two businessmen friends in Ulan-Bator – one of them owns a brewery where beer is brewed to a German recipe, while the other became wealthy as a shareholder in coal and copper mines – decided in favour of the Zetros as a more modern and luxurious way of negotiating the terrain. The two friends use their unique jumbo off-roaders for multi-day excursions into the Altai mountains, for example, where they hunt for wolves with an eagle. G 131-9 nine-speed transmission (eight forward gears + crawler) with a direct-ratio top gear, with a six-speed Allison 3000 SP/PR fully-automatic transmission available as an option. The VG 1700 transfer case for the permanent all-wheel drive has proved its worth for decades. At 1.690 the off-road ratio is a good 20 percent lower than in the Actros and Axor all-wheel drive models (which have an off-road ratio of 1.403). This makes extremely slow speeds possible, an important attribute e.g. on very steep downhill stretches. Pulling power is increased by around 70 percent compared to the on-road gears. Torque distribution between the front and rear axle(s) is 1:3.21 in the splitter box, and 1:1 if the differential lock is engaged. The Zetros is equipped with three mechanical differential locks as standard, and these can be easily selected by the driver using a rotary control. This rotary control shows the logical sequence in which the locks should be engaged as the terrain becomes more difficult: first inter-axle, then inter-wheel at the rear and finally inter-wheel at the front. Considering the positive attributes of this all-wheel drive cab-behind-engine vehicle, it is no wonder that the Zetros series has met with great interest from the energy supply sector, exploration and fire/emergency services. It combines outstanding all-terrain capabilities with equally excellent off-road ride comfort, and these advantages also convince private customers looking for a base vehicle with which to undertake longer journeys off the beaten track. Accordingly two examples of the Mercedes-Benz Zetros have been converted into hunting and expedition vehicles according to customer specifications by the body specialist Hartmann in Alsfeld and the interior equipment specialist Huenerkopf in Neukirchen. In each case the base vehicle was the Mercedes-Benz Zetros 2733 A with 6×6 drive (wheelbase 5350 mm) and the standard cab. The cab’s features include a padded sleeping berth for the driver, an air conditioning system, a 24 V audio system with CD player, a CD changer, a Bluetooth hands-free system and a 7-inch touch­screen to which a reversing camera is connected. 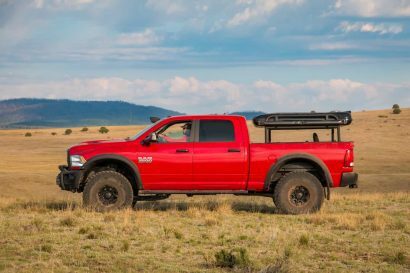 A carrier system with a load capacity of up to 100 kg is installed on the cab roof. Four auxiliary spotlights and a twin air horn are mounted on this carrier, and the radiator grille houses four flashlights in red and blue. At the rear there is a carrier for two spare wheels, with a dedicated lifting system which also enables cargo to be hoisted onto the cab roof. The reversing camera is able to activate additional spotlights at the rear for safe manoevring at night. An adequate operating range in remote areas is provided by diesel tanks holding 300 and 200 litres. In addition to difficult road conditions, the body and interior conversion work had to take into account the very special climatic conditions in the desert, where the vehicles are to be used. 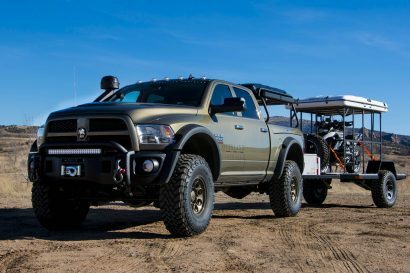 Extreme temperature fluctuations require particularly good insulation, and all the interior features were planned and installed to ensure that they are able to withstand the punishing conditions of off-road operations. The furniture was specially designed for use in tropical and desert regions. Both vehicles have substantially identical bodies, though one of the two examples also has a rear vehicle bay able to accommodate a quadbike. The luxury long-distance off-roaders have an imposing length of 10.70 m (plus 60 cm for the model with rear vehicle bay), a width of 2.70 m and a height of 4.20 m.
The living area is a fully-insulated sandwich construction with walls, roof and floor of prefabricated sandwich panels insulated with hard PU foam and bonded together. The body structure is reinforced with additional edge sections. The floor and roof have a thickness of around 100 mm, while the side walls are approx. 50 mm thick. The complete body structure is painted in the colour of the cab. The 800 mm wide entrance to the living area (710 x 255 x 200 cm) is on the right-hand side of the vehicle. Entry is assisted by integrated steps and grab handles, and the robust high-security lock with triple action can be operated from both inside and outside. The windows of the living area are double-glazed, can all be opened and are fitted with mosquito nets and roller blinds. The interior is clearly divided into different functional areas. The bedroom is located in the rear, and the comfortable leather seating group for four to six people is in the front. There is also a luxurious bathroom with a marble floor and underfloor heating, as well as a large galley. In addition to the bedroom in the rear there is sleeping space available in the living area itself. The table in the seating group can be electrically raised and lowered, and when lowered it creates an additional, large bed. The galley is fully equipped with a ceramic hob, microwave with grill, refrigerator/freezer, bar and coffee machine. The sink has a hot and cold water supply, and a precisely fitted dinner set for eight people is also on board. For outdoor use the vehicles have mobile twin-burner gas cookers with two 11 kg gas bottles. The bathroom has a separate shower cubicle, a WC/bidet combination, washbasin and three-door vanity unit. The bedroom is separated from the living area by a partition wall with integrated flatscreen TV monitors (40-inch and 46-inch, one each facing the bedroom and seating group). In line with the intended use as a hunting vehicle, a safe for valuables (400 x 400 x 300 mm) and a gunsafe for hunting rifles are permanently integrated into the interior. Neither is there any lack of entertain­ment, as the vehicles are equipped with a SAT receiver with an electrically self-aligning SAT dish, a DVD/CD player, an MP3 player, a Bose hi-fi sound system and a Mac Mini plus W-LAN router. The onboard technology is also very comprehensive. It is controlled and monitored by a central console with separately fused circuits. 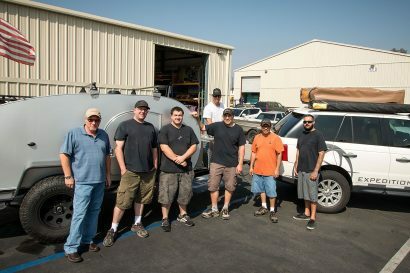 A water-cooled diesel generator ensures indepen­dence from the power grid, with energy stored by a battery set with four 220 Ah batteries. The batteries are charged by an automatic charger connected to the generator, or via the solar panels on the roof consisting of two modules with 80 watts each. All the electrical equipment is connected to the 230 V onboard network, and is supplied via an automatic 24/230 V transformer. The air conditioning system powered by the generator is separately and variably adjustable for all the rooms in the body interior. There are also electric ventilators in the bathroom and galley. A comfortably warm living area is assured by a diesel-powered heater which can be operated both when stationary and on the move. Separate water systems supply drinking water and water for the shower/toilet, with a total volume of around 250 litres (volume of waste water tank around 100 litres), and the drinking water passes through a water filter. A separate pump replenishes the fresh water tank from outside, while a 230 V hot water boiler holding 20 litres provides hot water for the galley and bathroom. If the weather permits, it is also possible to use the exterior shower. Especially as a 6×6 variant with six driven wheels, the Mercedes-Benz Zetros represents an unrivalled vehicle concept providing outstanding mobility and first-class traction.